Facebook Posts: Maximize brand awareness and community education to through your Facebook Business Page. Please be sure to review the information on the Facebook Posts and Campaigns components of the Growth Engine before continuing to review this article on the Website component. Companies are focused on driving more traffic to their websites. Where they fall short is what they attempt to do with those visitors once they are on the website. Whether you have obituaries or not, there are reasons people visit your website. It could be due to an upcoming event, google AdWords, or searching for information. Most websites are filled with generic information. It allows the visitor to come to your website and just leave. This scenario ends with you losing out on an opportunity until they decide to come back (assuming they come back). This is where the Growth Engine steps in. The Website component of the Growth Engine acts as the hub for the Facebook and Email portions of the Growth Engine. Moving your website isn’t required for the Growth Engine to get results. It will function just fine, however you are likely to not achieve maximum results. 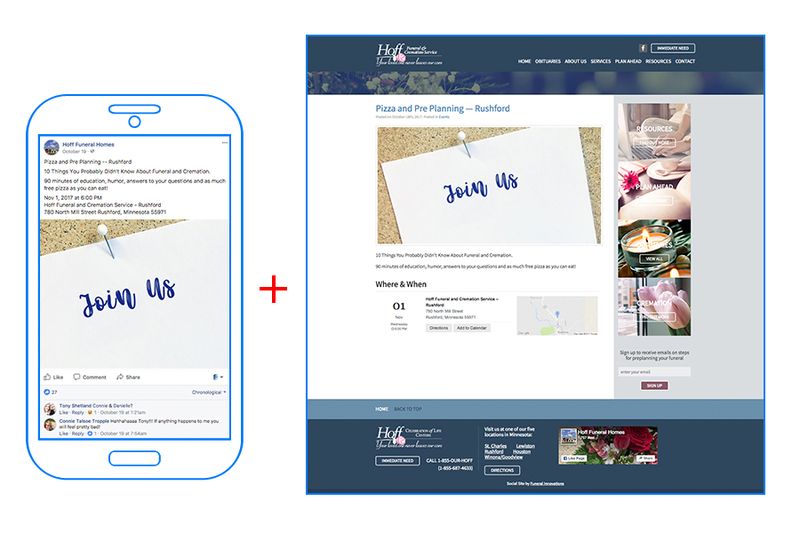 The Growth Engine is designed so each component (Facebook, Website, Email) integrate flawlessly with each other. If your package does not include the Website, or you choose not to bring your Website over to us, here is an example (left) of the landing page that is created. Campaigns that include a landing page will direct the Facebook user to a generic url (www…) with your logo and branding. These landing pages are still highly effective, even though they do not link back to your url (www.yourwebsite.com). As the Growth Engine continues to keep a conversation on your Facebook page through the Facebook Posts component of the Growth Engine– linking back to your website is key. Many of the posts will automatically generate a link back to your website where people can learn more about specific topics. Your staff doesn’t have to go in and edit anything. The Growth Engine automatically inserts the link back to your website on relevant posts. Once directed back to the page, the intention is to get the visitor to take action. 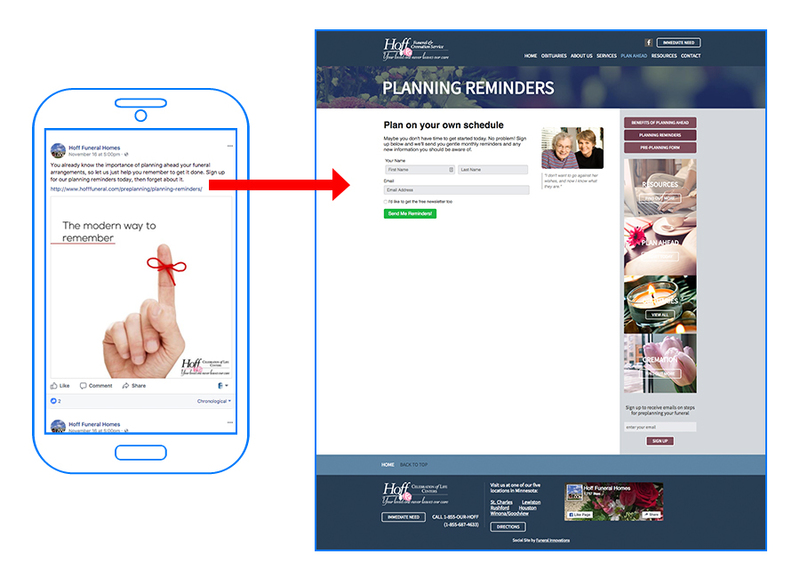 The goal is to have the visitor fill out a planning ahead form (pictured above). Managing a blog can be a burden on your staff and an inefficient use of your time. That’s the reason many companies don’t keep their blog active. The challenge is having an active blog that helps improve your SEO and drives traffic back to your website. Events, community involvement and education are great uses of a blog. With the Growth Engine we make managing a blog simple. With just a simple click, the Growth Engine will create a blog post for you, distribute it to your website, share it on Facebook and include it in your newsletter. Here (left) is an example of a blog post created and shared on Facebook through the Growth Engine. Best of all, very little effort is needed by your staff. Simply share the details with us, and everything else happens magically. As mentioned above, one key advantage of the Growth Engine Website is an emphasis on collecting emails from visitors. The intention isn’t to push a hard sell on them, but instead to have the ability to keep in touch with them after they leave your website. The focus is on capturing emails in every possible opportunity. 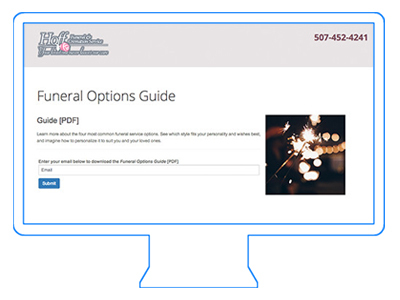 Throughout the Website we promote your newsletter to encourage signups, and offer the newsletter for each person who leaves an obituary tribute. Within the Website there are opportunities for visitors to enroll in ongoing email outreach. 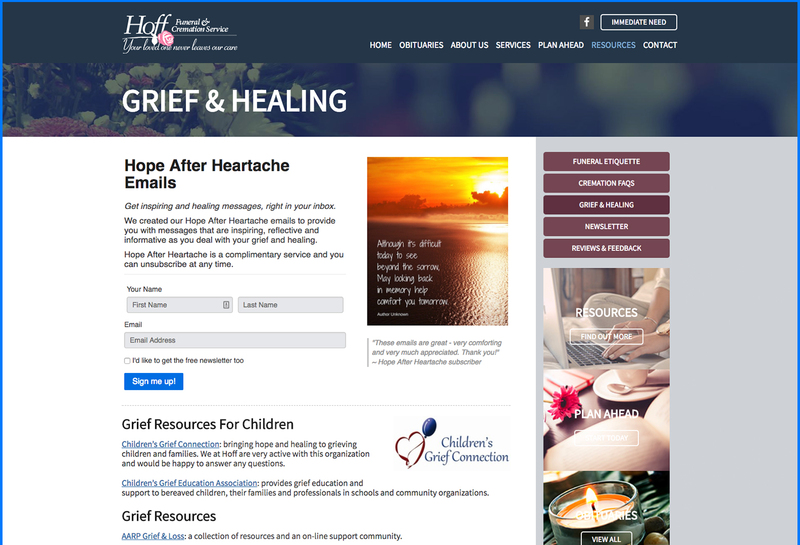 A few examples of how visitors are given the opportunity to provide their email for ongoing outreach is with our Grief Support emails and Pre-planning Reminders. 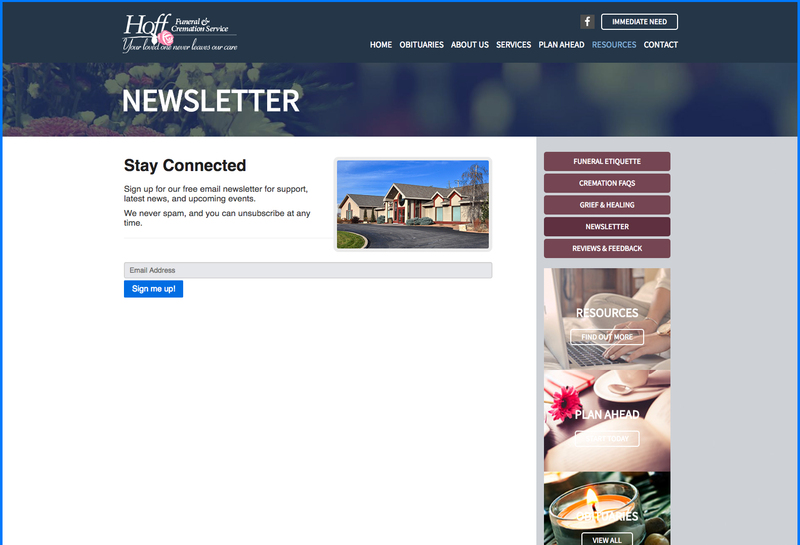 Once the visitor enters their email, they are given the option to be added to the newsletter. We have found that most visitors opt into the newsletter. The visitor is then sent the ongoing emails they requested and are sent he monthly newsletter from your company. You continue your level of service through their inbox without any extra work on your staff.